The box mentions various patents, the last 425653 is from 1935. The Royal 'appointments' are for the 'Late King George V' and 'Prince of Wales' 1929-36, so bulb (or box) is made after 1936 and probably before 1939. 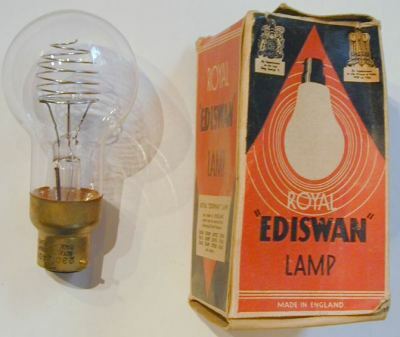 Royal Ediswan motor car light bulb with pip and coiled tungsten filament that looks like some other process has also been applied to the wire. It has a different look to other early coiled tungsten, slightly sparkling. Marked 'Royal "Ediswan" - Gasfilled - Made in England' and on the other side 'Rotax G100'. Rated 12v 2A SBC base. Probably made in the the 1913-early 1920's period. 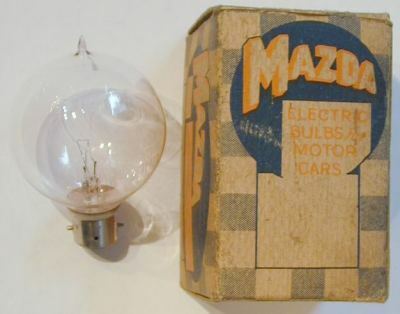 There is a box but this is a BTH Mazda car bulb box. However, the box contains card supports for a pip top bulb so it might be the correct box - I suspect that bulbs were subcontracted to BTH and Ediswan by Rotax and they were not particular about which box was used. Rotax were suppliers of electrical equipment for cars. Box lists patents of 1912 and 1913. Royal Ediswan, metal filament pip top 230v 16 cp. This was the company created in 1909 by Edison and Swan to market their metal filament lightbulbs. 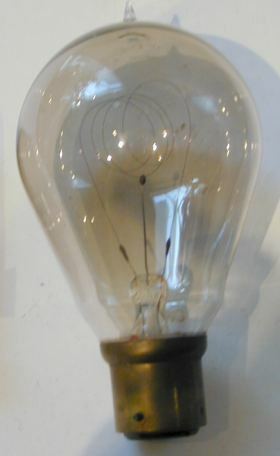 This bulb was made between 1909 and 1919 introducing the modern bulb shape. Each had held patents that prevented them from selling their bulbs themselves and while they fought in the courts a joint company was the only viable option in the end - giving them a monopoly in light bulb production until 1896.